I usually note take when I’m at these events, and for some reason, Open Space tends to bring out the artist in me. The conversation at the learning technologies event focused less on the technology itself, far more on behaviours. Here’s the sketch note I made whilst at the event. During the arts session, there were lots of opportunities to talk, so I proposed a session called ‘Would You Like to Paint?’ where instead of having a conversation, we just made art together. Here’s some of our work. At the mental health conversation, I was introduced to Monica Biagioli, a senior lecturer at London College of Communication. Monica showed me a new device, called The Zine. We were given a piece of paper, folded with a few cuts in it, and invited to record thoughts and ideas as we conversed. The way the paper is cut means you can refold it into many shapes, which in turn means the things you originally noted adjacent to one another, can be repositioned. Here are some photos showing side one and two of my zine, and a folded version. I love how, as you move from conversation to conversation, taking notes as you go, the notes can be refolded and repositioned, taking the dialogue in new and unexpected directions. Very zen. Almost two months after attending the mental health open space event, the zine is still in clear view on my desk. Bearing in mind my desk doubles up as a mini art studio, the continued presence of the zine is no mean feat! I think it is an excellent tool for recording, and remixing ideas. Thank you Monica, for this great, and simple idea. A version of this post first appeared on HRExaminer in May 2018. Update. I recently met Monica Biagioli again, and she has kindly provided additional information relating to the Zine project. I’m delighted to share this with you here. Monica Biagioli, Allan Owens and Anne Pässilä started their collaboration around the Zine Method in a participatory innovation process in social enterprise where the focus was to capture citizens’ perspectives and ideas as well as to create a space for sharing multiple perspectives into a development process. After that we have systematically applied the Zine Method in various contexts: IFKAD, Bari, Italy, 2015; GNOSIS, London, UK, 2016; IFKAD, Dresden,Germany, 2016; PhD students at University of Chester, UK; MA students at University of Chester and University of the Arts London, UK, 2017 onwards; ArtsEqual LUT research as artful inquiry, Lahti, Finland; Zamek Cieszyn, Cieszyn, Poland, 2018; RSA NHS R&D Mental health care session, Liverpool, UK, 2018; University of Central Lancashire, 2018; Realising Potential Ltd application in leadership coaching and as facilitation in business, 2018 onwards; ACAT Conference 2018, application of method by conference participants during the conference. By Zine Method we mean the design response of the ‘zine’ as a means for self-reflection and to improve communication. Zines (small (maga)zines) have roots in the do-it-yourself movement. The idea and use of the zine has emerged over time, from the early leaflets and pamphlets produced by independent publishers in the late 18th century, to the amateur press movement of the 19th and 20th centuries, to the subculture of fandom that emerged in the 1930s in science fiction, to spread later to the punk and riot grrrl movements, up to current times. Zines are applied as a method of collecting and analysing data within a framework of qualitative analysis to retain more of the shape of the complete experience (Dewey) and allow for emotional responses to emerge within the zine format. Zines can be solely for private consumption (self-reflection) and can therefore act as containers to process difficult emotions, such as the ones that emerge in conflict situations. The definition of Learning Technology can be described as the ‘study and ethical practice of facilitating learning and improving performance by creating, using and managing appropriate technological processes and resources’ Richey, R.C. (2008). On Tuesday I visited the Learning Technologies Next Generation fishbowl discussion. This gave me a chance to catch up with a few friends, and watch and engage with a conversation topic of interest, using a conversational technology I enjoy. Typically a fishbowl discussion is set up as shown in the diagram above, in the round with a panel in the centre. 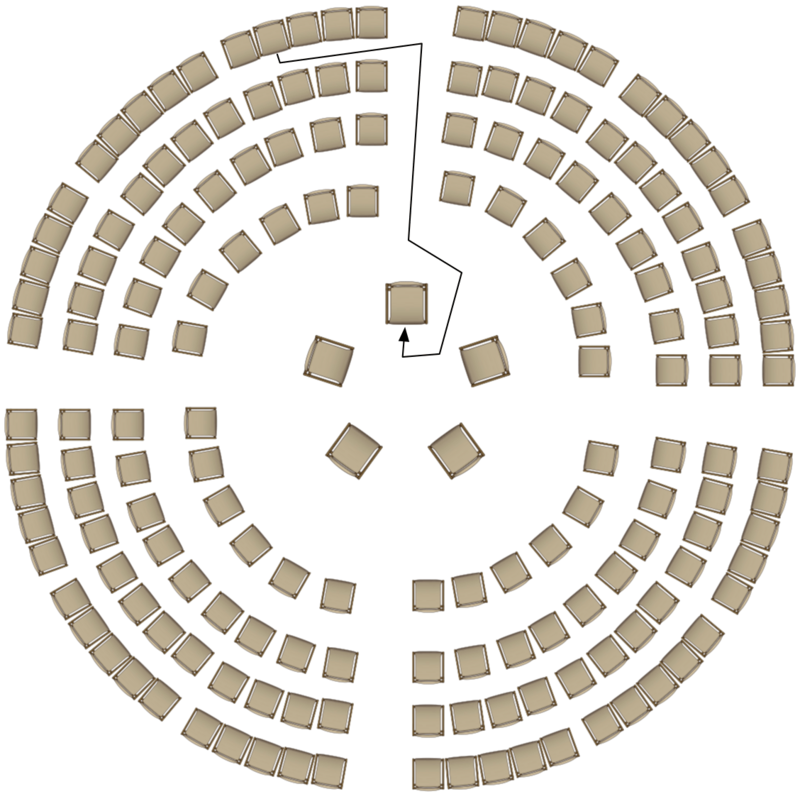 In an open fishbowl – one of the centre seats is vacant and at any point in the discussion, that seat can be filled by an audience member. Traditionally, when the empty seat is filled, one of the existing panel members moves to the audience. This way, there is always a space to be filled, should anyone wish to do so. The panel members were Euan Semple, Lorna Matty, Ger Driesen, Beth Aarons and the session was facilitated by Nigel Paine. I chose to sketchnote the event. 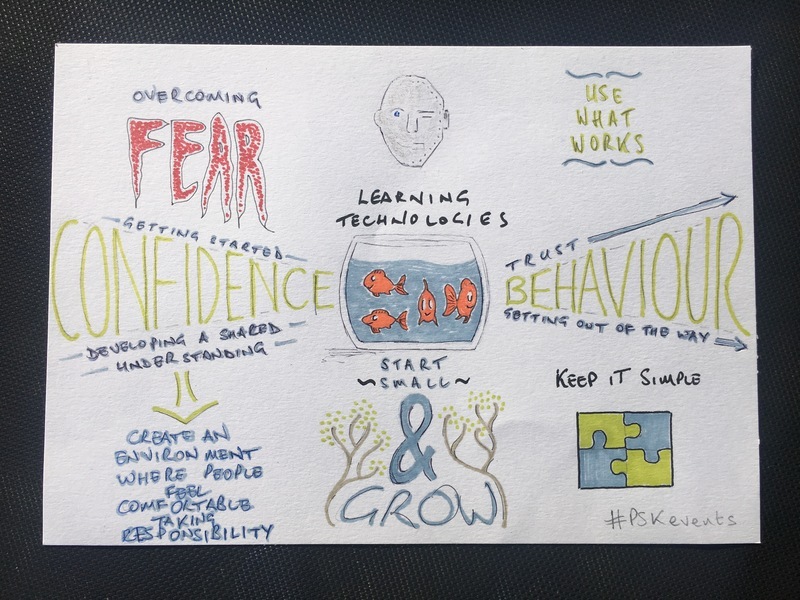 I’d not made a sketchnote in a while and wanted to practice, to see how I got on. Notwithstanding that I couldn’t capture as much detail through this method, I enjoyed listening, and creating an interpretation of what I heard. getting out of the way – managers take note! I enjoyed being at the event. Afterwards, one thing I reflected on about the structure, was that on this occasion, the panel stayed put, and the one empty seat was occupied and vacated by different audience members at various points in the conversation. My personal preference is for the panel members to self select out of the centre as the empty seat is occupied as described above. This means the make up of the panel can and often does change completely, and that can create really interesting shifts in the discussion. That said, I really enjoyed listening to the exchange of thoughts and ideas. If anyone who was at the fishbowl is reading this, please let me know what I missed. And given this session was a precursor to the 2018 Learning Technologies conference in London today and tomorrow, I wonder how many of these themes will also feature there?